Heat. This race is all about managing heat. The high of 95 degrees F and intense humidity made this the toughest Ironman race I have ever completed of any length. I raced the half and thought many times I couldn’t imagine racing a full in this kind of heat. This race was not about a personal record or a world championships slot for me; it was about getting fully into the body and feeling everything from this past season. 5 months out from a bike crash and grade 3 AC shoulder separation, my focus was on testing shoulder strength, Celebrating imperfect ability, imperfect recovery. Testing the spiritual strength brokenness offers. Putting myself through a bonfire and seeing what survives. Check-in logistics for this race are complicated. The race check-in at the host hotel is midway between T1 (bike check-in) several miles to the north and T2 several miles to the south. T1 is at the bottom of a very long, steep hill, which you can’t drive down. Leave at least an hour to park, walk down, get body marked, check-in the bike, and walk back up to the parking area. About a 20-min drive from T2 to T1 for run check-in, which has to be completed the night before the race—don’t count on being able to access a run transition bag on race morning. The ocean water gets very warm, very fast. I cannot imagine wearing a wetsuit in this race, even if it’s legal temp. One more reason to settle in and drop the heart rate as soon as possible. The swim’s end can sneak up on you as the depth changes quickly. Definitely take the time to apply sunscreen well during T1, especially if racing the full. Even as early as 8AM on the road you will be in full sun. The bike course is beautiful. Long, steady climbs at low grades mean a tough effort but super fun descents. The roads for the entire bike course are very well paved—seemed brand new—mostly highways closed for the race, into and out of the mountains surrounding Los Cabos. The bike was over too soon, but given the heat it was really hard to gauge how much to push it for the last 10miles. I had no idea how a half marathon would feel in the mid-day heat, so I played it very conservative and I think this contributed to a steady run. In this race it was rare for even athletes at peak conditioning not to walk some part of the run because the heat was just too much. Two run superpowers: salt tabs and ice! I took a salt capsule every 30 min (started the last 30min of the ride) and absolutely believed that saved my legs. I almost couldn’t walk the first few steps off the bike, legs totally buckled but sure enough give it 3 miles and I found a rhythm that was never easy in the heat, but steady. I didn’t push it; my goal was simply to run the entire 13.2 mi, not to walk. That meant 9-ish min miles. What saved my mind: ice, ice baby. There were aid stations at least every mile, and I sipped a few sips of ice water at every one, poured the rest out or down my back (avoid your shoes! I saw so many runners sloshing through soaked shoes 5mi in and then walking through blisters miles later. Keep the feet as dry as possible!) and slipped the big pieces of ice down the front and back of my top, behind my visor on my head, and—this is key—held ice in my hands almost the whole race. Hands are the body’s major heat conductors. Simply holding ice felt like it cooled my whole body. The last 3 miles were pure hell. That simple. I ran on rage at the heat, and started dropping to 8min miles. The feeling of passing peak-conditioned athletes walking at the end of that gnarly run is amazing and worth the strategy of holding something back. Unless you train in crazy heat and humidity you simply don’t know what your body is going to do the second half of the run. The finisher’s chute is high energy, right in the center of town. It always amazes me how much transfers as I approach a chute. Completely drained seconds before, round a corner to a cheering crowd and discover some extra gear hidden down underneath everything. Sub-7-min pace into the finish line. The most incredible feeling of the day was stepping into a blow-up pool ice bath in the shade of the finisher’s plaza, biting into a hot piece of pizza. Totally spent. Completely happy. 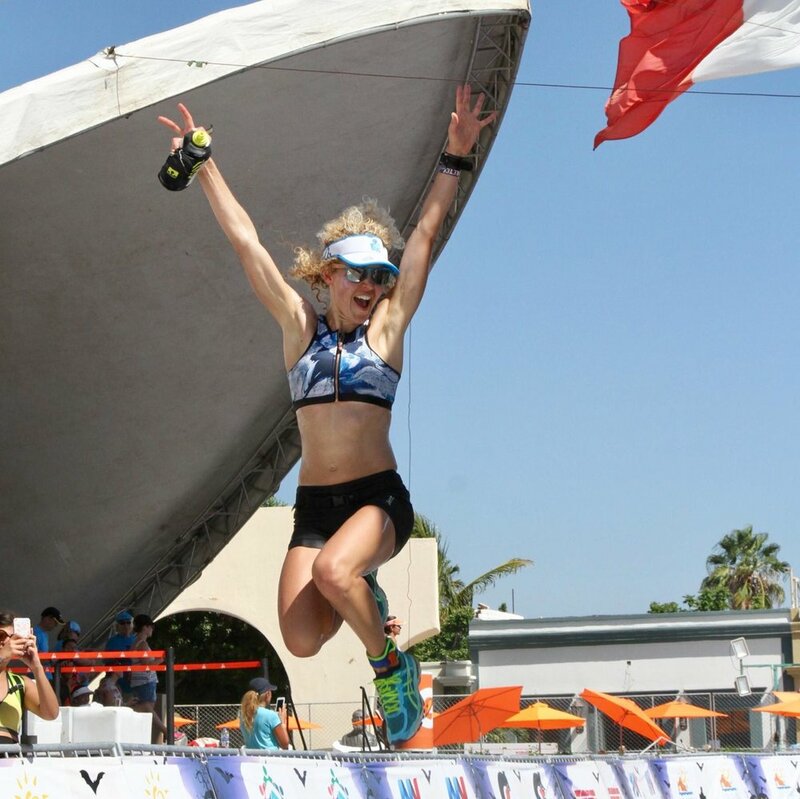 Have a plan to get out of old town Los Cabos after the race. Every paved street is shut down/re-routed. We found a dirt road through corn field, dodged cows and dogs and somehow found our way back to El Ganzo Hotel, which is funky, rustic perfection on the marina. Mezcal & sushi by the infinity pool overlooking the Pacific, and a deep, long sleep. Cheers to now.